Set a playfully elegant table with the silver plated and lidded cheese/ jam dish in the Vertigo pattern. Vertigo’s bold motif — a subtly asymmetrical, thick ring often placed playfully askew — can be found on every piece in the collection designed by Andrée Putman. 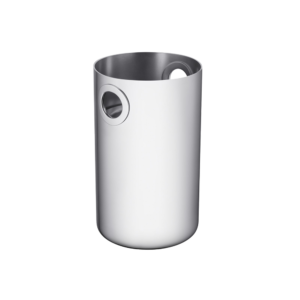 This stainless steel wine cooler bucket, with flush holes that act as handles, makes an ideal housewarming, hostess or wedding gift and is an essential part of every home bar. The hip and modern Oh! collection provides most basics one needs to throw the perfect cocktail party or celebration while being anything but. 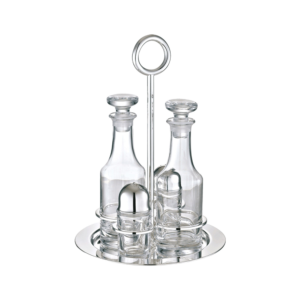 The Albi oil and vinegar cruet set includes a silver plated rack with center handle and two crystal cruets/bottles with stoppers to hold oils and vinegars. The Albi line, created in 1968, takes its inspiration from a French town located between Toulouse and Bordeaux and its famous cathedral known for its remarkable architecture, clean straight lines and single nave. 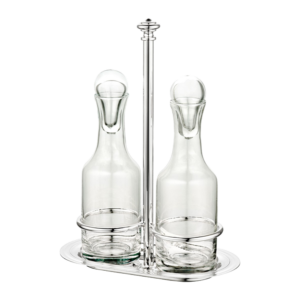 The Vertigo oil and vinegar cruet set comes with two crystal bottles with stoppers to store oil and vinegar and a silver plated stand that also has compartments to hold salt and pepper shakers. Vertigo’s bold motif — a subtly asymmetrical, thick ring often placed playfully askew — can be found on every piece in the collection designed by Andrée Putman. 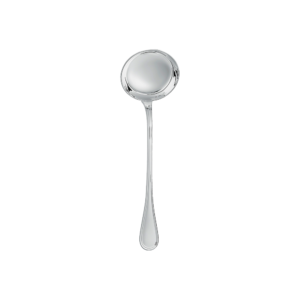 The silver plated soup ladle in the Albi pattern can also be used to serve fruit salads. The Albi line, created in 1968, takes its inspiration from a French town located between Toulouse and Bordeaux and its famous cathedral known for its remarkable architecture, clean straight lines and single nave. 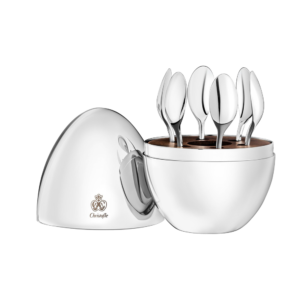 Set of 6 silver plated espresso spoons.